The Adaptive Payments API enables you to send money in many different scenarios, from simple to complex. Note: The application owner must have a PayPal Business account. Senders and receivers can have any PayPal account type. Senders and receivers are not required to have PayPal accounts initially. PayPal prompts a sender to create an account before a payment can be completed. A receiver must create an account to receive the funds after the payment completes. This diagram shows a payment in which the sender pays multiple receivers in a parallel payment. With parallel payments, the sender can see the transaction to each receiver. In a chained payment, the sender pays the primary receiver an amount, from which the primary receiver pays secondary receivers. The sender only knows about the primary receiver, not the secondary receivers. The secondary receivers only know about the primary receiver, not the sender. For example, you might use this configuration in a sales commission application that transfers funds owed for commissions from your account to the accounts of your sales force. Adaptive Payments provides several kinds of payment: simple, parallel, and chained payments. You create each kind of payment with the Pay API. Simple payments enable a sender to send a single payment to a single receiver. For example, your website can use an Adaptive Payments payment flow to transfer money resulting from a sale from your customer&apos;s PayPal account to your own account. This is the traditional kind of payment. Parallel payments enable a sender to send a single payment to multiple receivers. For example, your application might be a shopping cart that enables a buyer to pay for items from several merchants with one payment. Your shopping cart allocates the payment to merchants that actually provided the items. PayPal then deducts money from the sender&apos;s account and deposits it in the receivers&apos; accounts. Chained payments enable a sender to send a single payment to a primary receiver. The primary receiver keeps part of the payment and pays secondary receivers the remainder. For example, your application could be an online travel agency that handles bookings for airfare, hotel reservations, and car rentals. The sender sees only you as the primary receiver. You allocate the payment for your commission and the actual cost of services provided by other receivers. PayPal then deducts money from the sender&apos;s account and deposits it in both your account and the secondary receivers&apos; accounts. Note: Chained payments also include delayed chained payments, in which payments to secondary receivers can be delayed for up to 90 days. Simple payments enable a sender to send a single payment to a single receiver. This is sometimes considered a traditional payment, such as a payment from a buyer to a seller. Buyer makes a payment on a merchant&apos;s website. Buyer makes a single payment for a cart of items from the same merchant. 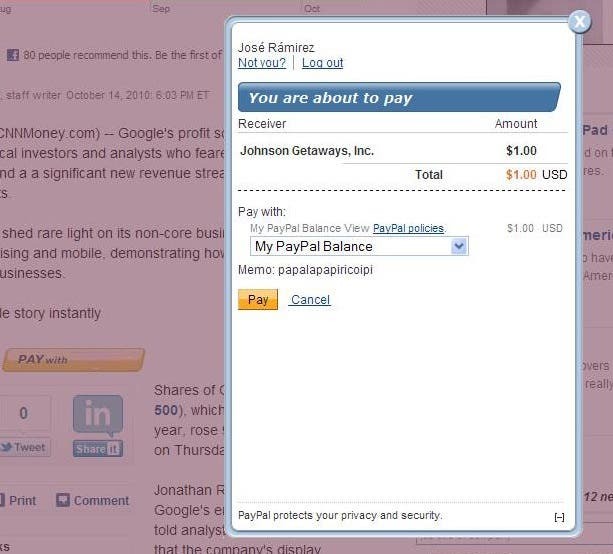 Person on a social networking site makes a payment for a purchase to the receiver. For example, a sender sends money to pay for lunch at a restaurant. A parallel payment is a payment from a sender that is split directly among 2-6 receivers. Technically, a parallel payment is a set of multiple payments made in a single Pay request. a single payment for multiple items from different merchants, such as a combination of items in your inventory and items that partners drop ship for you. purchases of items related to an event, such as a trip that requires airfare, car rental, and a hotel booking. Note: This scenario is an example only and does not take PayPal fees into account. A chained payment is a payment from a sender that is indirectly split among multiple receivers. It is an extension of a typical payment from a sender to a receiver, in which a receiver, known as the primary receiver, passes part of the payment to other receivers, who are called secondary receivers. Note: The API caller must get permission from PayPal to use chained payments. In this example, the primary receiver receives $100 from the sender&apos;s perspective. The primary receiver actually receives only $10 and passes a total of $90 to secondary receivers, Receiver 2 and Receiver 3. By default, payments to all receivers in a chained payment are immediate. However, you can choose to delay a payment to a secondary receiver. For example, as primary receiver, you may require secondary receivers to perform some action, such as shipping goods or waiting for expiration of a return period, before making payment. To complete the payment, you must explicitly execute a payment to secondary receivers after the sender pays you. The payment must occur within 90 days, after which you cannot complete the payment as part of the original chained payment. The sender of a payment must approve the transfer. The sender can log in to paypal.com to approve each payment, pre-approve payments, or when the sender is your application, be implicitly approved to make payments. Note: Preapproval requests require permission from PayPal. Explicit approval payments, in which the sender logs in to paypal.com to approve each payment. Explicitly approving payments is the traditional way to pay with PayPal. This method is the only option unless the sender has set up a preapproval agreement or you, the API caller, are also the sender. Preapproved payments, in which a sender logs in to PayPal and sets up pre-approvals that approve future payments or set up a preapproval during the embedded payment flow. The sender logs in to paypal.com once to set up the preapproval. After the sender agrees to the preapproval, specific approval is unnecessary. Implicit approval payments, in which your application is both the sender of a payment and the caller of the Adaptive Payments Pay API. In this case, PayPal makes the payment from your own account, which eliminates the need for approval. Adaptive Payments services are divided into these categories: standard services that do not require specific permission to use and advanced services that require permission from PayPal to use. You obtain permission to use a service when you submit an application to PayPal. To use any other service, you must receive permission from PayPal to use the service when you submit your application. For example, if your application makes chained payments, which is an advanced service, you request permission when you submit your application. Later, if you modify your application to support pre-approvals, which is also an advanced service, you must resubmit your application to obtain permission from PayPal to use the service. Important: If you allow a third party to PayPal to execute an application on your behalf, the third party becomes the API caller because the party is now calling the Adaptive Payments API. The third party must also have permission from PayPal to use the advanced service. For example, if an application supports chained payments, both you and the third party must have permission to use the service. Explicit approval payments require the sender to log in to paypal.com to approve the payment. You control the interaction between your application and PayPal by specifying URLs for redirection in various situations. 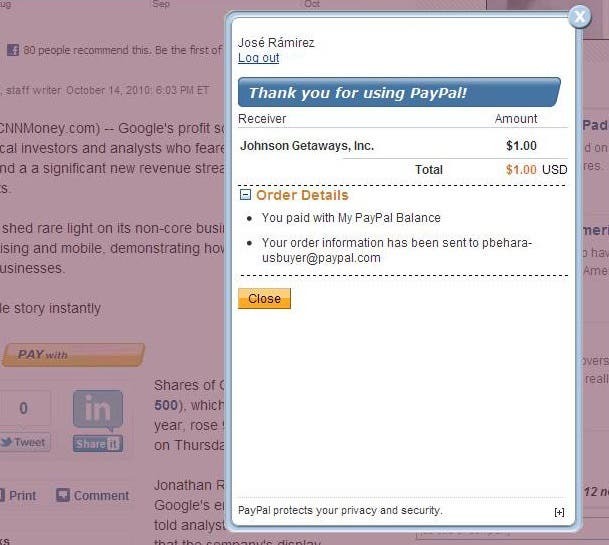 Your site or device sends a Pay request to PayPal on behalf of a sender. PayPal responds with a key that you use when you direct the sender to PayPal. You redirect your sender&apos;s browser to paypal.com. After the sender authorizes the transfer of funds, PayPal redirects your sender&apos;s browser to the location you specify. Note: The cancel operation is not shown in the diagram. Cancellation is handled by a separate cancellation URL to which PayPal redirects the sender&apos;s browser any time the sender cancels while on paypal.com. In addition to these steps, PayPal notifies you and the sender of the payment. Preapproved payments require the sender to log in to paypal.com to set up the payment agreement with a particular vendor. You control the interaction between your application and PayPal by specifying URLs for redirection in various situations. Your site or device sends a Preapproval request to PayPal on behalf of a sender. PayPal responds with a key, called a preapproval key, that you use when you direct the sender to PayPal, and once the preapproval has been established, whenever you automatically complete a payment on behalf of the sender. You redirect your sender&apos;s browser to PayPal. After the sender logs in to paypal.com and sets up the preapproval, PayPal redirects the sender&apos;s browser to a location you specify. Note: The cancel operation is not shown in the above diagram. Cancellation is handled by a separate cancellation URL to which PayPal redirects the sender&apos;s browser any time the sender cancels while on paypal.com. In addition to the steps shown above, PayPal sends an email notifying you and the sender that the preapproval has been created. Your site or device sends a Pay request to PayPal on behalf of a sender. You can require the sender to provide a personal identification number (PIN); however, logging in to paypal.com is no longer required. Note: You must provide a preapproval key that identifies the agreement. PayPal still responds with a payment key that you can use for other API operations, such as for obtaining details of the payment or for issuing a refund. Implicit approval payments are payments where the sender and the API caller are using the same account. Because PayPal draws the funds for the payment from your own account, there is no approval necessary, and as such there is no visible flow for implicit approval payments. Your site or device sends a Pay request to PayPal. Note: A web flow is not required. PayPal responds with a key that you use for other API operations. An embedded payment is a payment that initiates a visual presentation of the Adaptive Payments payment flow in which the sender appears to never leave your checkout or payment page. Embedded payments make it easier for a sender to make a payment because PayPal may allow the sender to bypass the PayPal login step. The ability to bypass the login relies on a remember me cookie, which is stored in the sender&apos;s browser when the sender chooses to take advantage of being remembered. Opting in reduces the number of steps to purchase goods or services without significantly increasing the risk that the sender&apos;s account might be misused. After the initial login, PayPal bypasses the login step if subsequent payments meet specific criteria, such as a subsequent payment for a small amount. You choose your preferred visual presentation when you invoke the embedded payment flow. In some cases, PayPal may override your choice to use a lightbox; for example, when the sender is required to log into PayPal for the initial payment. You can also enable pre-approvals for future payments or enable shipping addresses to be associated with embedded payments. Important: Payments for digital goods must use the embedded payment flow. You cannot associate a preapproval for future payments or enable shipping addresses in a payment for digital goods. You must call the Pay API operation to obtain a payment key before launching the embedded payment flow. If the payment is specifically for digital goods, modify your Pay API operation to specify that each receiver is receiving payment for digital goods. The IFRAME also enables the sender to sign up for a PayPal account or pay as a guest without logging in. Note: Guest checkout only provides the visual benefits of an embedded payment. It does not reduce the payment steps. The check box controls the remember me behavior for log in. This behavior allows the sender to skip the log in step in cases where there is little risk of the account being misused. Important: Opting in to the remember me behavior does not guarantee that the sender will not be asked to provide log in credentials. When the sender clicks Close, PayPal redirects the sender&apos;s browser to the return URL specified in the Pay API operation&apos;s request message. Note: Unless there is an error with the payment itself, PayPal transfers the money regardless of whether the preapproval for future payments was successful. For subsequent payments in which PayPal does not require the account holder to log in again and the account holder has chosen to be remembered, PayPal bypasses the log in steps. The actions you take to launch the flow and close the lightbox are the same steps you take for the mini-browser. You can call the GetShippingAddresses API operation to obtain the selected shipping address for the transaction using the key associated with the payment. This example assumes that you obtain a payment key before initiating the flow and that the key does not change or expire before the sender completes the flow. Call the Pay API operation to obtain a valid pay key. Create your form or button. You must include the pay key and redirect to https://www.paypal.com/webapps/adaptivepayment/flow/pay. Specify that a lightbox opens in the PayPal-created IFRAME, PPDGFrame. Set the expType parameter to indicate your preference for the context in which the PayPal payment flow is displayed. You must specify light for lightbox. Note: To modify an existing application to use the embedded payment flow, change the redirect from https://www.paypal.com/cgi-bin/webscr?cmd=_ap-payment&paykey=... to https://www.paypal.com/webapps/adaptivepayment/flow/pay?paykey=... after obtaining the pay key. Create an embedded flow object and associate it with your payment form or button. Set the expType parameter to mini to indicate your preference for the context in which the PayPal payment flow is displayed. Note: To modify an existing application to use the embedded payment flow, change the redirect from https://www.paypal.com/cgi-bin/webscr?cmd=_ap-payment&paykey=... to https://www.paypal.com/webapps/adaptivepayment/flow/pay? paykey=... after obtaining the pay key. if echo $PAYMENTDETAILS | grep -q "\&status=COMPLETED"
then  echo "Thank you for approving pay key $PAYKEY"
else  echo "Sorry, you were unable to approve pay key $PAYKEY. Please try another transaction!" PayPal displays the default shipping address and allows the payment sender to change the address when you set senderOptions.requireShippingAddressSelection to true in your request to the SetPaymentOptions API operation. You call the GetShippingAddresses API operation to obtain the selected shipping address after invoking the embedded payment flow. Call the Pay API operation with actionType set to CREATE to obtain a payment key. Set senderOptions.requireShippingAddressSelection to true in your request to SetPaymentOptions and call the API operation. Redirect the payment sender&apos;s browser to the embedded payment flow at https://www.paypal.com/webapps/adaptivepayment/flow/pay?paykey=... after obtaining the pay key. After returning from the flow, call the GetShippingAddresses API operation to obtain the selected shipping address. Adaptive payments supports guest payments, which are payments using a sender&apos;s credit card without logging into PayPal to complete the transaction.The sender is not explicitly identified as a PayPal account holder during the transaction and is not required to have a PayPal account. Each receiver of a guest payment must be a verified PayPal Business Verified or Premier Verified account holder. Note: For European Union countries, only 10 guest payments are allowed per card. You can set up a payment transaction so that either the sender of a payment pays the fee or the receivers of a payment pay the fee. If receivers pay the fee, you can specify whether the primary receiver in a chained payment pays the entire fee or whether all receivers pay a portion of the fee. Note: Fees are determined by PayPal and are based on criteria, such as the transaction volume of the receiver. In the examples that follow, the fees shown are representative only and not actual fees. In this example, the sender pays a total of $510.83, which includes all fees. Note: The previous example scenario does not represent actual PayPal fees. Note: The scenario above is an example only and is not representative of actual PayPal fees. 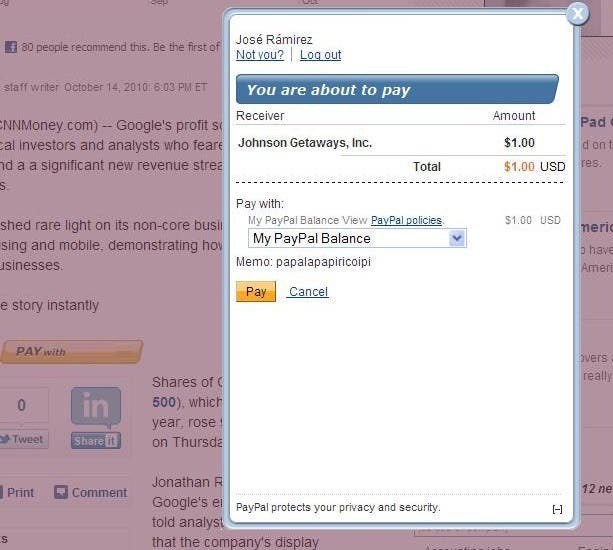 In this example, the primary receiver, identified as the merchant, pays a fee for $20 received. Each of the other receivers also pay a fee on the amount each receives. The Consumer Financial Protection Bureau adopted the Remittance Transfer Rule, which provides new protections to consumers who send remittance transfers to other consumers or businesses in a foreign country. The rule requires fee disclosures and cancellation procedures, as well as new dispute resolution procedures. Note: This guide summarizes the Remittance Transfer Rule, but you should consider obtaining legal advice for your compliance obligations. Remittances initiated from US based accounts to non-US accounts. Transactions worth more than $15 regardless of the funding currency. Payments where the sender is a consumer and the recipient is a natural person or a business. The Remittance Transfer Rule specifies pre-payment disclosure to senders; that is, before payment is authorized. Disclosure includes the recipient&apos;s name, the amount transferred in the funded and received currencies, all fees and taxes charged, the exchange rate, the total amount charged to the sender (including the fees and taxes), and the final amount received by the recipient. You use the GetPrePaymentDisclosure API to disclose this required information. The Remittance Transfer Rule specifies post-payment disclosure; that is, after payment is authorized. Disclosure includes the recipient&apos;s name and information (phone number and/or email address and address if available), pre-payment disclosures, the date by which the recipient can access the funds, information about the state agency that licenses the provider for payment, and cancellation and dispute resolution rights. Mobile transactions need not be displayed on the screen but can be sent via email. The ExecutePayment API includes the call to disclose the required post-payment information.